This feature allows you for example to stream to your work PC your music and videos from your home Media Server. foobar2000 is a Windows program but it can run on other platforms through the Wine project. On macOS, the easiest way to install foobar2000 is through Wineskin. First, you must make sure the status page of BubbleUPnP Server shows that it is accessible from the Internet. You can access your Media Server from the Internet for streaming music and videos on Windows, using the foobar2000 music player as the client. 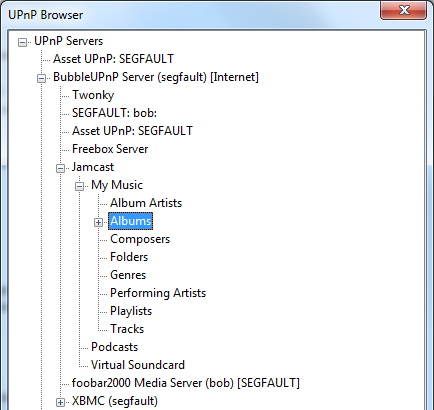 After installation, in the View menu of foobar2000 select “UPnP Browser”. The UPnP Browser window displays all your discovered LAN Media Server allowing browsing an playing music as shown in the left screenshot. TIP: If you are on a corporate network only allowing outgoing HTTP traffic on port 80, you can setup BubbleUPnP Server to run on port 80 (provided you have no other web server using this port). For HTTPS, use port 443. This “Super” Media Server lists all your Media Servers on your remote LAN for which the setting “Make this Media Server available in Android BubbleUPnP and foobar2000 for Internet access” is enabled in BubbleUPnP Server (in the Media Servers tab). To disconnect or remove the BubbleUPnP Server “Super” Media Server from the UPnP Browser, right click its root node and select “Remove server” in the context menu. As with Android BubbleUPnP as a client, it is possible to transcode audio on the fly when accessing your Media Servers with foobar2000. 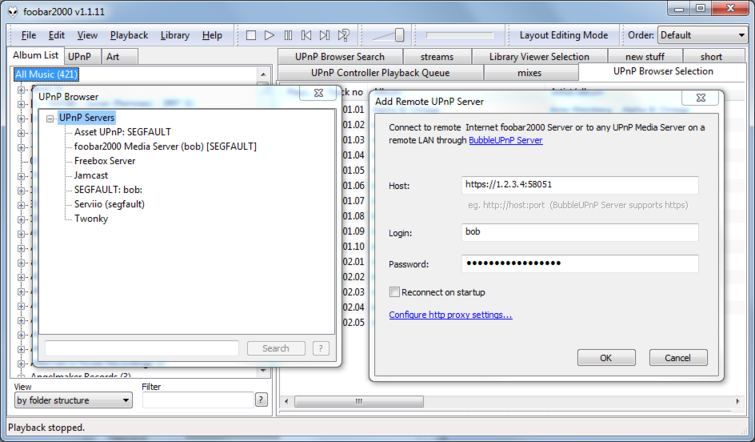 Unlike Android BubbleUPnP, the transcoding settings are configured in BubbleUPnP Server, in the “Settings / foobar2000 remote access” tab. Max audio bitrate: all files whose bitrate is greater than the specified bitrate will be transcoded to the specified bitrate. If bitrate is unknown, transcoding is performed. Set to “None” to disable all transcoding. Apply Max audio bitrate only to lossless audio: if enabled, only lossless files (FLAC, ALAC, …) are applied the Max audio bitrate rule so only lossless files will possibly be transcoded. This prevents any lossy->lossy transcoding which should be avoided if possible, if audio sound quality is important. Transcoded files will not be seekable in foobar2000. Changing these settings will only take effect in foobar2000 when browsing folders that were not previously browsed. To apply changes on browsed folders, you must disconnect/reconnect the BubbleUPnP Server “Super” Media Server.